Claremont, Calif. (May 13, 2016)— The Udall Foundation recognized Pitzer College junior Hernan Gallo-Cornejo’s dedication to environmental justice with a 2016 Udall Scholarship. 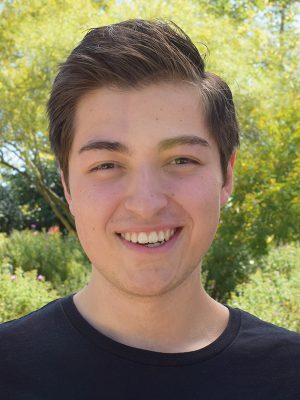 He is one of 60 students from across the US—and the first male student from Pitzer—to be named Udall Scholars this year. At Pitzer, Gallo-Cornejo has coordinated “toxic tours” in the LA area to highlight air pollution and environmental challenges in the urban landscape as a Robert Redford Conservancy for Southern California Sustainability fellow. He has taught English as a second language to day laborers and served as president and treasurer of the Latinx Student Union. A first-generation college student himself, he has served as a first-gen mentor at Pitzer. An environmental analysis major and French minor, Gallo-Cornejo plans to become a professor in environmental studies and conduct research on air pollution, focusing on people who are disproportionately impacted by environmental degradation. Gallo-Cornejo, the other 2016 Udall Scholars will travel to Tucson, AZ, in August to learn more about the Udall legacy of public service and interact with leaders in environmental fields, tribal health care and governance. A 15-member independent review committee selected this year’s group of Udall Scholars from 482 candidates nominated by 227 colleges and universities on the basis of commitment to careers in the environment, American Indian health care, or tribal public policy; leadership potential; record of public service; and academic achievement. The Udall Foundation was established by the US Congress in 1992 as an independent executive branch agency to honor the late Congressman Morris K. Udall. The foundation has awarded 1,524 scholarships totaling $7,740,000 since 1996.